I met an area rabbi for the first time this morning. He shared his sacred space with me, his holy book with me. We planned this meeting last week before the shooting at the Tree of Life synagogue in Pittsburg. What a difference a week makes. If God works in mysterious ways, then humans work in maddening ones. I didn’t want to be brought together over this. We share a smile but it is tinged with a familiar pain. We share a hug but we are holding on for dear life, precious life, fleeting life. Bagels with cream cheese and coffee are now mixed with incomprehensible sadness. Lighthearted conversation impossible now. What were we going to talk about? What is there to say now? I am at a loss. Tonight, I will share in lament and mourning with my Jewish brothers and sisters. I call upon you to share their grief as well because it is our grief as human beings. Share their loss because it is our loss. Cry out for us. Bow your heads with us, for all of us now. Recently, there has been a push to remove symbols of America’s racial past, specifically those related to American slavery. In 2015, the Confederate flag came under scrutiny in North Carolina after the murder of nine worshippers at Mother Emanuel A.M.E. Church by 21 year old Dylann Roof. Roof wanted to start a race war and the flag seemed to hail a time when African American bodies were legally the enemy, the inhumane, the property of another. Their death, his aim and that flag reminded many Americans that things had not changed, that we were not as progressive as our politics would have us to believe. The fight over the flag is proof that some Americans were still on the Confederate side of history, that secession had occurred some place deeper and within the hearts of Americans. Taking it down was an effort to take back again the truth that Africans and later African Americans were not created as property but as people. Still, the tug-o-war continues. And while there are those who would downplay the attack on Mother Emanuel A.M.E. Church as an anomaly or the work of some secret hate group that somehow evaded our surveillance for a moment, that would suggest that Roof somehow broke loose from an otherwise harmless group with a morally reprehensible message, that he just got riled up and took it too far, then we are only lying to ourselves. Furthermore, our ability to take this position is a privileged one as we cannot walk in his victims’ shoes. They are buried under six feet of earth and less we trample over their graves by dismissing or diminishing the hatred that was expressed in their murders, we might take a few minutes to examine the signposts that led Roof to them. 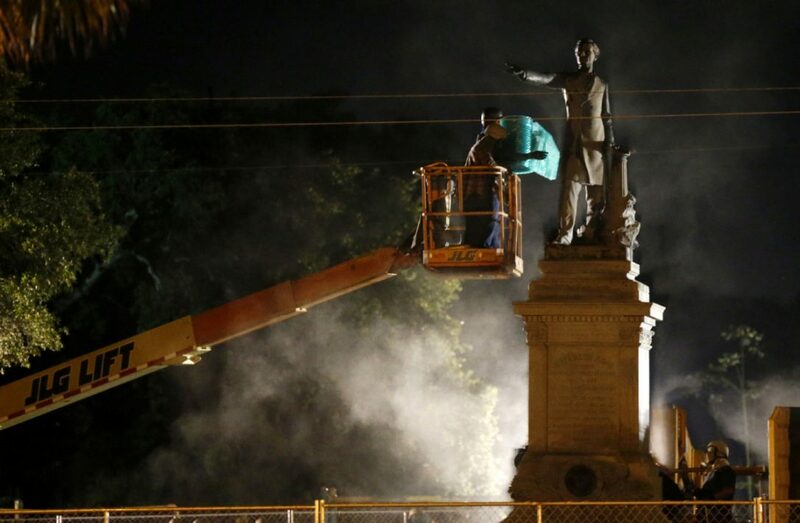 New Orleans is the latest to remove a symbol of the Confederacy, that is the eleven slave- holding secessionist states of the U.S. Its members did not want to let go of African American bodies and the statue of Jefferson Davis, the president of the Confederacy, reminds us of that. This history is repeated by the presence of his image, told from his perspective. Towering above us as a kind of giant, he is positioned to look down on us. It is comparable to empowering the confessions of an oppressor. For those who have been oppressed, they are not interested in his side of the story for it makes them no less enslaved and no more free. Besides, they know what he thinks and the last thing they need is a reminder of his power and presence in their lives. Putting the past behind us is not the goal but putting persons in their rightful place is. Statues are reserved for champions, heroes, heroines, leaders, martyrs and idols. Which one do you suspect Davis is? Because we don’t memorialize villains, right? Or are we expected to believe that he was a good, slave- holding person? Still, there are those who want to leave the granite figure and the past as it is. They conclude that we cannot change history and removing this symbol does nothing. But, is this true? 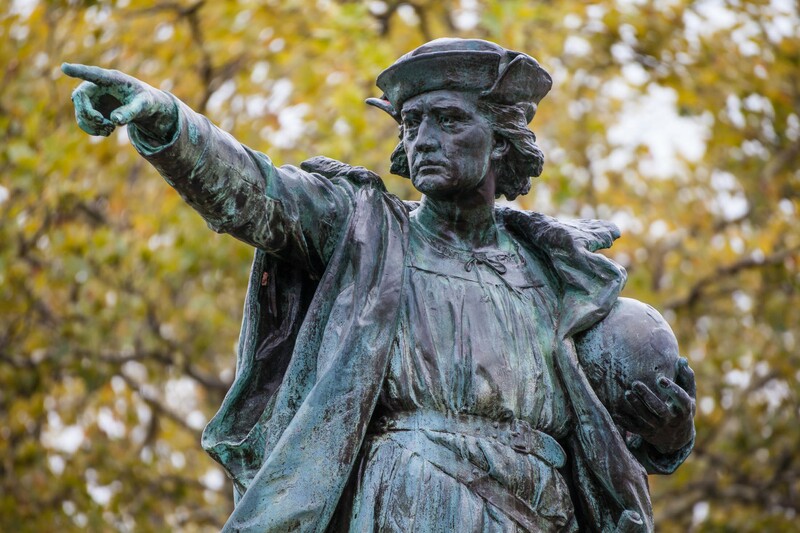 Symbols serve as historical markers, representatives of meanings past. Unlike a picture, these statues are worth more than words but are tied to experiences and ideologies that have cost the dignity, emotional and mental health and very lives of persons not socially colored white. And when we erect monuments that reference actions we now understand to be offensive at least and inhumane at worst, we reinjure and suggest that the symbol and not our words carry more weight. And what is hidden or being held in place by these cultural tokens and signposts? Why do we choose these graven and woven images instead of relationships? What of these symbols have a hold on us and get in the way of us practicing community? Why would we pledge allegiance to a Confederate flag over and against our fellow brother or sister? Why would we allow a statue to speak for us, material that we have molded and sculpted to get in between us? How can we call ourselves the United States when we have symbols that segregate?